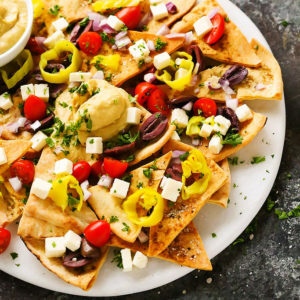 Super Bowl Snacks to Kick Off the Big Game! So maybe you’re not a Super Bowl fanatic. Maybe you don’t know who’s playing — or even who’s singing the national anthem or performing at halftime. Maybe you don’t even tune in to see the ingenius (and sometimes not so ingenius) commercials. Still and all, Super Bowl snacks are an all-American tradition. 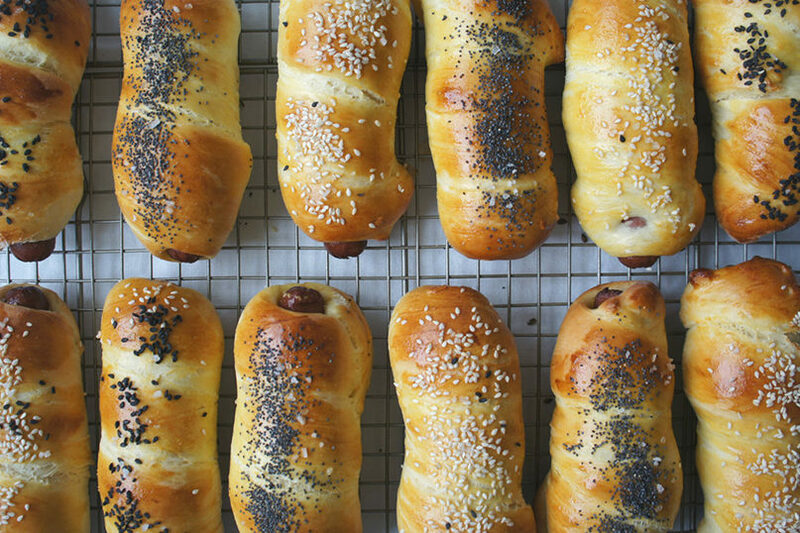 To up your own game, here are a few Super Bowl snack faves…with a Jewish twist. Use any challah recipe you prefer. Roll your challah into roughly 3-oz pieces, then snake them around the hot dogs, brush with a beaten egg and add any topping you like. Sarna suggested making an “everything bagel” topping by combining 1 Tbsp sesame seeds, 1 Tbsp poppy seeds, 1 Tbsp dried garlic 1 Tbsp dried onion and 1/2 Tbsp thick sea salt and then sprinkling it on top. 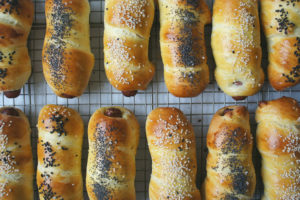 Or, top with poppy seeds, black sesame seeds or even caraway seeds. Make your challah dough: In a small bowl, place yeast, 1 tsp sugar and lukewarm water. Allow to sit around 10 minutes, until it becomes foamy on top. In a large bowl or stand mixer fitted with the whisk attachment, mix together 1 1/2 cups flour, salt and sugar. After the water-yeast mixture has become foamy, add to flour mixture along with oil. Mix thoroughly. Add another 1 cup of flour and eggs and mix until smooth. Switch to the dough hook attachment if you are using a stand mixer. Add another 1 1/2- 2 cups of flour, mixing thoroughly and then remove from bowl and place on a floured surface. Knead remaining 1/2 cup flour into dough, continuing to knead for around 5 minutes (or however long your hands will last). Place dough in a greased bowl and cover with damp towel. Allow to rise at least around 3 hours, punching down at least once if possible. Serve warm. If there’s extra green tahini dip leftover, store in an airtight container in the fridge. To make the green tahini, place the garlic clove and parsley in a food processor and pulse until very finely chopped. Alternatively, chop them finely by hand. In a large bowl, combine the garlic and parsley mixture with the lemon juice, salt, tahini and water. Whisk together well! It will seize at first, but keep whisking! You may need more water depending on how thin or thick you want your tahini sauce. Taste and adjust seasoning with salt and lemon juice. Set aside. Pre-heat the oven to 200 degrees F to keep the schnitzel warm until ready to serve. Set up a cooling rack on top of a baking sheet. In 3 separate dishes combine the dredging mixes. In the first container, mix the flour, mustard powder, salt and pepper. In the second, whisk together the eggs and Dijon mustard. 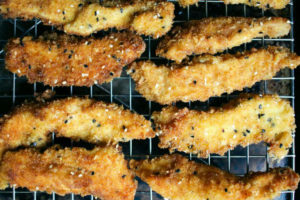 In the third, combine the breadcrumbs, panko, sesame seeds, paprika, garlic powder, salt and pepper. The secret to ths non-dairy ranch dressing is in letting it sit in the refrigerator after you make it, to let the flavors really meld. When you first stir it together, it tastes fine – a bit mayonnaise-y, but pretty good. But give it at least an hour in the refrigerator (better yet, leave it in overnight, covered), and you get something that is very hard to distinguish from regular dairy ranch. Oh, and don’t skip the part where I suggest lining your baking sheets with foil before baking the wings. It will spare you much aggravation and elbow pain when it’s time to clean up. Line 2 baking sheets with foil and set aside. Melt the pareve butter/margarine over low heat in a sauce pan and add the salt and hot sauce, whisking well to combine. Cook just until the butter has melted and whisk frequently. It’s important to keep the butter and sauce from separating. Taste for salt and heat, and if you like, add more cayenne. Divide the wings and 1/4 of the sauce between 2 gallon-size zip-top bags. Push as much air out of the bags as possible, move the wings around in the bag to ensure they are well-coated, and marinate in the refrigerator for at least an hour, or as long as overnight. 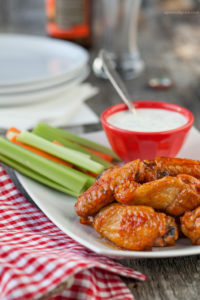 While the wings marinate, whisk the ranch dressing ingredients together in a mixing bowl until fully combined. Cover tightly with plastic wrap and refrigerate until ready to use. Combine the flour, salt, and pepper in a bowl or baking dish and stir well. Preheat the oven to 425°F. Remove the wings from the marinade and shake off any excess marinade from each one. Working in batches, lightly dredge the wings in the flour mixture to coat. 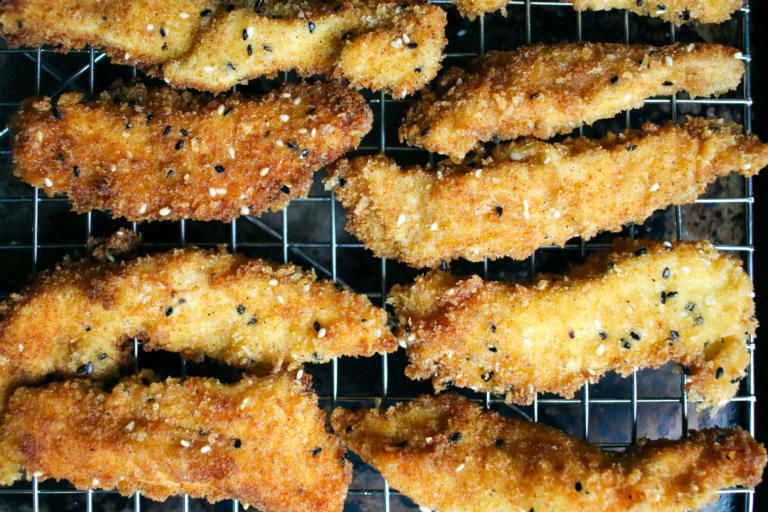 Arrange the wing pieces skin-side-up on the prepared baking sheets, making sure to leave a little room between each piece. Cook undisturbed for 30-35 minutes until golden brown, and until the wings release easily from the baking sheet. Using a pair of tongs or a spatula, turn the pieces over and return to the oven to bake for an additional 15 to 20 minutes, until very crisp. When the wings have finished cooking, remove from the oven. Transfer the sauce into a baking dish or mixing bowl. Working in batches, toss the cooked wings in the buffalo sauce until well-coated, then transfer to a platter. Serve the wings immediately, with the vegetables and ranch dressing. Much healthier and just as filling and even more delicious than the traditional loaded nachos! These guys are packed with gorgeous eye popping color, crunch, flavor, spices and with nearly half the fat. Included here is a recipe for homemade cucumber yogurt, but store-bought is just fine, as is store-bought hummus. The chicken can be done ahead of time and shredded when you’re ready to make the nachos. Season chicken breasts with turmeric, cumin, zaatar and salt and pepper. Drizzle with olive oil and coat everything evenly all over chicken. Roast chicken in the oven at 400 degrees F for about 20 minutes, or until fully cooked through. Allow to cool enough to handle and use your hands or forks to shred chicken. Reserve on plate. You can make the pita chips at the same time as the chicken. Place pita wedges on a baking sheet and season with turmeric, zaatar, cumin and salt and pepper. Drizzle with olive oil and bake in the oven at 400 degrees for about 20 minutes. Reserve on a plate. To build your nachos, start with the pita chips on the bottom, then chicken, feta cheese, chopped salad, olives and top with hummus, yogurt sauce and finally with chopped onion. You can use this method for any sweet kugel recipe your family likes – with raisins, cinnamon, thin noodles, whatever. The recipe will take a fair bit of time because you need to chill the kugel overnight, or at least 4-6 hours. If the kugel isn’t properly chilled, the balls will not hold their shape while frying. Yields two dozen kugel balls. Preheat oven to 350 degrees. Grease a deep, square baking dish (8×8 or 9×9). If your baking dish not a square, the kugel will be too thin and you won’t be able to scoop the kugel into balls. Cook noodles according to directions (around 8-10 minutes). Drain and use right away. Place butter in a large bowl. Add hot noodles right on top and allow the butter to melt. In another bowl, whisk eggs, sugar and vanilla together. Pour mixture on top of noodles and mix. Add sour cream, crushed pineapple and salt and mix again. Pour noodle mixture into greased baking dish. Bake for 35-40 minutes or until just golden on top. Place in fridge overnight. Using a medium or large-size cookie scoop, form chilled kugel into balls. Place on a baking sheet or place and put into freezer or fridge for 20 to 30 minutes. This will help them keep their shape when frying. Heat vegetable oil over medium-high heat in a large, deep pan. Kugel balls don’t need to be completely submerged in oil, just about halfway. Place cornflakes crumbs in a bowl. In another bowl combine eggs and milk. Remove kugel balls from freezer. Dip into egg mixture, then cornflake crumbs. Fry balls in oil, about 1 minute each side until golden brown. 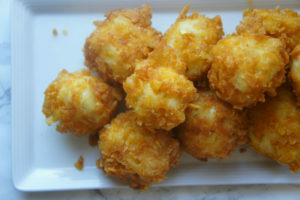 Place fried kugel balls on a paper towel-lined plate to remove excess grease. Sprinkle lightly with sea salt while still hot. Top with powdered sugar if desired. Serve warm.